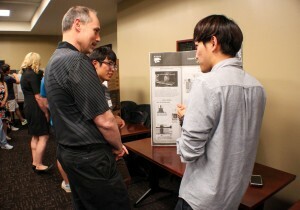 The 24 South Korean Summer Institute students, sponsored by the Korean Ministry of Science and Technology completed their unique five week Embedded Systems, Cyber Security and English technical writing courses and presented their work in a Poster Session in the Leadership Studies Building. This was their capstone project that brings together technical writing and presentation skills, manipulation of visual elements and oral communication proficiencies. “These students are very enthusiastic, and are excited about preparing their demonstration and asking for advice. 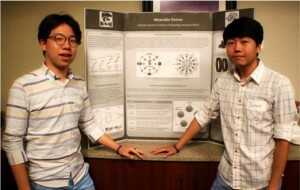 The poster session will include impressive demonstrations, and topics such as Android backdoor, DNS spooling attack, Social engineering and more” said Daniel Wang.